In findings published by The Telegraph Monday night, 55 per cent believe Parliament is “determined to block Brexit,” that figure including 38 per cent of Remain voters and 87 per cent of Leavers. Fewer than one in five (19 per cent) disagree. 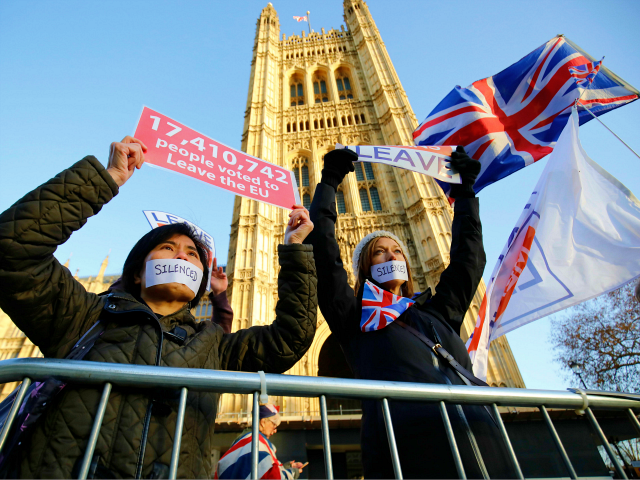 The poll of 2,030 adults also found that a large minority (41 per cent) believe that instead of delaying Brexit the UK should make a clean break of the bloc, leaving on World Trade Organization (WTO) terms, while just 28 per cent disagreed with that view. Voters also think that failure to deliver Brexit by revoking Article 50 could damage British democracy, by 53 per cent, while 20 per cent said they would never vote again if lawmakers attempt to stop Brexit. Our new polling shows 41% agree that instead of delaying Brexit, Britain should just leave to trade on WTO rules on March 29th, compared to 28% who disagree. The results follow another ComRes poll over the weekend which revealed that while 35 per cent of voters believe “the UK should stay in the EU and abandon the process to leave,” 24 per cent believe the UK should leave as scheduled on March 29th on WTO terms without a deal; 14 per cent believe the UK should leave on March 29th with “a new deal negotiated by the government and the EU”; and 12 per cent believe the UK should leave on Friday with Prime Minister Theresa May’s Withdrawal Agreement as it is. Adding all leave-supporting positions together, 50 per cent of those polled back some form of leaving the EU — a 15 point lead over those who want to stay in the EU. Another poll released Monday for Brexit campaign group Leave Means Leave published by The Sun found that the petition to cancel Brexit, much publicised in the mainstream media, is considered “irrelevant” by 52 per cent of people compared to the vote to leave the European Union in June 2016, the largest political mandate in British political history. 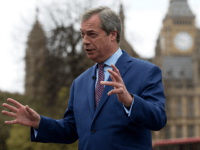 The petition passed the five million mark on Sunday, becoming the most signed petition in the House of Commons, but even 28 per cent of Remainers stated that the petition, which is open to abuse by foreign actors, fake signatories, and can be signed multiple times by the same person, is still meaningless. "I signed it three times in the names Donald Tusk, Jean-Claude Juncker and Michel Barnier." The establishment media also gushed over the People’s Vote march — which is pushing for a second referendum — quoting liberally in headlines from organisers that “one million people” were protesting to overturn a democratic mandate on Saturday. Fact-checkers Full Fact assess that “There almost certainly weren’t a million people on the People’s Vote march,” saying that experts in crowd estimation put the number at as low as less than one third of People’s Vote estimates. London’s Metropolitan Police told Full Fact that “We do not confirm crowd figures for marches or protests,” with figures being left to come from estimations by event organisers instead. Many readers asked us to check the claim that 1 million people attended the People's Vote march on Saturday.